1 April - Bad timing on my part today. I intended to take more newt pictures tonight but left it too late, and it is now raining heavily after being dry all day. The newts continued to be active in the shallow end all day, but I had decided to wait until after dark because of sky reflections on the water surface, and my movement at the water's edge disturbed them. 2 April - Another pleasant Spring day with long sunny periods and no rain. 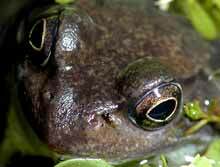 The frogs are starting to reappear from the vegetation now and are on the lookout for food around the sides of the pond. A couple got quite excited when I put an earthworm down near them, but failed to catch it. This one just watched me as I got closer and closer to it, and didn't move at all as I took its photograph, complete with fly on its snout. At the shallow end, more and more tadpoles can be seen swimming, although most are still clumped around the old spawn where there is a good growth of algae. While they all look almost black when you take a casual look at them, it surprises me how they seem to vary in colour when seen in photographs, ranging from grey, through purple and even blue! Newts continued to feed on them through the day. This one had just eaten one when I took its picture. It appears that most if not all the adult newts I see in the area are males, judging by their frills. 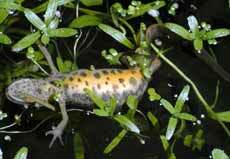 The females can be seen amongst the floating plants in the deeper part of the pond. 3 April - I took an after-dark look at the pond last night and was well rewarded. 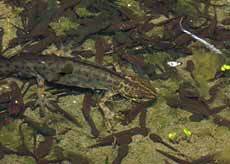 I was hoping for some more pictures of newts hunting, but they were not down the shallow end. 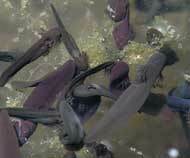 Instead, there were a number of females amongst the floating plants obviously egg laying. This one caught my eye as she flipped over in open water before swimming into a clump of Water Starwort (Callitriche platycarpa) which seems to be a favourite for egg laying. Exposing her brightly coloured underside in this way would be very risky during the daytime. Near the top-left corner you can see an egg already laid in the fold of a leaf. Moments later had her hind feet wrapped around a plant as she started to lay an egg. If you look at the top-centre of the picture you can see the egg mentioned above. Here is a close-up of her hind feet as they hold the folded leaf around her cloaca (genital opening) while the egg is being laid. Here are images of the cloacal area of two females, showing how it protrudes slightly in a way that would seem to fit snugly into the folded leaf. And finally, having recorded this intimate moment I thought that I should include a portrait of the female. Before coming back into the house I had another look at the shallow end, and disturbed something that swam with great haste into the cover of the pond edge. A careful look revealed this little surprise - a tiny frog, no more than 15mm in length, and clearly one of last year's brood, although I didn't expect to see any this small out in the open at this time of the year. 9 April - Things have been pretty quiet in the pond over the last week. 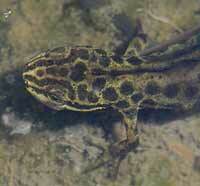 The tadpoles continue to grow and the newts continue to prey on them. 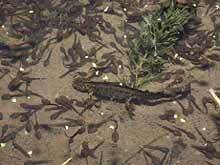 In this picture the newt is even walking on them as it chooses its next meal! 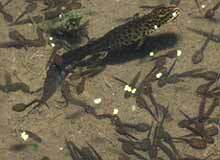 13 April - The newts' big feast continues, with the tadpole meals getting bigger by the day. When I first looked into the pond, there must have been 14 or 15 newts around the shoal of tadpoles, taking the occasional rush into the crowd to choose a meal. 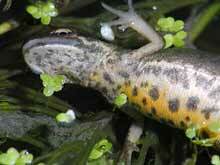 The tadpoles scatter as they detect the movement if the newt is too quick. This male was taking a moment to swim up to the surface in order to breathe. 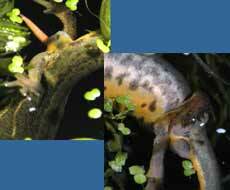 20 April - The tadpoles continue to grow and the newts continue to feed! 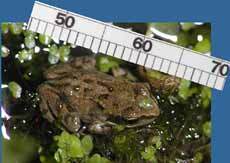 The most obvious changes to be seen in the pond at the moment concern the plants. Plants are shooting up all over the place. On the water surface the reddish green, oval leaves of the Pondweed (Potamogeton sp.) have started unfurling (In the top right corner you can see a leaf that has yet to do so). The rounded leaves at the bottom of the picture are of a Fringed Water-Lily plant (Nymphoides peltata). 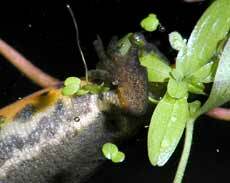 Also, the Water Starworts, the plants favoured by the newts for egg laying, are spreading quickly.